As plans for the POW camp took shape, Bischoff decided to build the five three-muffle furnace crematorium in the main camp and to build another with two three-muffle furnaces at Birkenau. He informed Prüfer, who had his drawing office start work on this Birkenau project, which was worth another 24,0(X) RM to Topf. But Bischoff had favoured Prüfer too much, and following a high-level meeting at the Auschwitz Bauleitung on 27th February 1942, with the presence of Dr Ing Kammler from Berlin, the project for the two-furnace crematorium, considered by Kammler to be superfluous to requirements, was dropped and the fivefurnace crematorium was shifted from the main camp to Birkenau. Prüfer. annoyed by the cancellation of this order, claimed the sum of 1,769.36 RM to cover the cost of the design work already done for the two three-muffle furnace crematorium. In May 1942, the large-scale gassing of arriving transports of Jews began in Birkenau Bunkers I and 2. As far as Prüfer and Messrs Topf were concerned, the shift from “normal” to"abnormal” commercial operations occurred about this time, between April and June 1942. The Bauleitung started modifying the drawings of the new five-furnace crematorium, produced at the end of January 1942, to convert the premises into an instrument of extermination. Prüfer could not fail to have been informed, as it was he who supplied the technical data for this building to the young Bauleitung SS Second Lieutenants. We know absolutely nothing about the attitude of the Topf management when they learned about the physical elimination of the Jews in which they were necessarily participating with their cremation furnaces. But there were only two possible lines of conduct: to flatly refuse to proceed, or to accept the situation, more or less reluctantly. The SS had powerful arguments: first of a “moral” nature, it was an order of the Fuhrer ["Führerbefehl"]: second, there were pickings rich enough to overcome any outmoded scruples, for it was no longer a matter of one or perhaps two crematoriums to build, but FOUR, all using Topf furnaces. All the circumstances combined to make these installations necessary: the mass graves of the victims gassed in Bunkers 1 and 2 were a catastrophic health hazard, the Jewish convoys were becoming ever more frequent. and a typhus epidemic was raging through the camp. The one solution to all these problems was incineration, The SS could have done this in open-air pits, but Prüfer was there, with an eye to profit, and was able to guide the SS towards a more modern solution. his own furnaces. He provided all the information they could require. 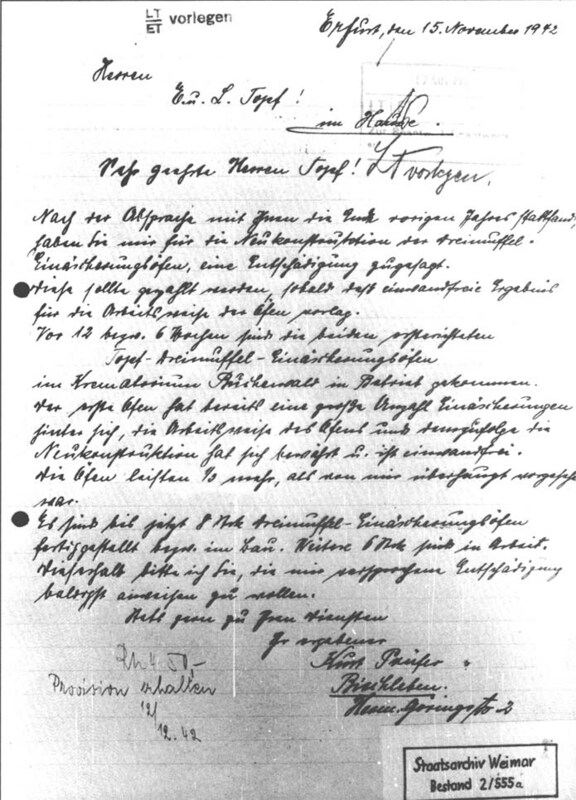 In July-August 1942, the different contracts (for the shells of the buildings, damp-proofing, roofs, drainage, furnaces and chimneys) for the four Birkenau Krematorien were signed. The total amount involved was 1,606,500 RM and the 264,000 RM for Topf was enough to remove any lingering scruples. Prüfer was at the peak of his career. His first two three-muffle furnaces had started work in KL Buchenwald on 23 August and 3rd October 1942 respectively, and tests had proved that they functioned perfectly and their throughput was one third higher than planned. The equipment destined for Birkenau Krematorien II and III was therefore reliable and efficient. As soon as the construction of the last two Krematorien (IV and V) had begun, Prüfer seized the opportunity on 15th November 1942 to boost his bonus of December 1941. He received a further 450 RM on 12th December [Document 4]. This second hand-written letter from Prüfer formally proves that the two three-muffle furnaces in KL Buchenwald, which certain people have claimed were built AFTER the war, were in fact installed in mid 1942. While the first bonus of 150 RM was paid for the designing of the 3 and 8-muffle furnaces, the second bonus of 450 RM was connected with the number actually sold by this date. Of the 14 manufactured, 12 were definitely installed (2 at Buchenwald and 10 at Birkenau) and it would appear that 2 remained in stock, no buyer having been found.